Today’s post is about wedding accessories that are very appropriate for brides who are looking to add a glam touch to their appearance, and pearl accessories are the number one go-to source. There are hardly any limits when it comes to using pearls for the bride’s wedding day look, so keep reading to find out how you can incorporate wedding pearl accessories. We are certain that the wedding dress, shoes, cakes, hairpieces, shoulder accessories or handbags, can all become more elegant and refined if they are embellished with pearls. We will not cover wedding gowns, because we already wrote an entire piece about pearl wedding dresses. Plus, we also have a post about pearl wedding cakes. In case you need some inspiration, you should definitely check these articles too 😊. As we previously mentioned, we will only cover pearl accessories that are perfect for brides. We propose five main types of accessories that can be adorned with pearls. Whether they are real pearl or faux-pearl embellishments, they make bridal accessories so glamorous and precious. What we love about these wedding accessories is that they are all very chic and stylish! Bridal hair pearl accessories are a fantastic way to decorate your hair or to simply finish a simple, yet elegant hairstyle. The beauty of wearing pearl hair accessories is that they look ravishing in both light colored hair and darker hair. We only selected a few wedding hair accessories with pearls, but there are so much more variations. These pearl accessories are delicate, extremely feminine, perfect for a vintage dress or a romantic look. From subtle single gem stones to fancy pearl hair combs, pearls have a way of making you look truly enchanting. And if you’re having a vintage inspired wedding, the romantic pearl hair chain is a true statement piece! Pearl veils are also some of the most beautiful wedding hair accessories and they come in different forms. Just look at the delicate bridal veil with pearls and the delicately decorated birdcage! You will totally add a twist with a pearl shoulder accessory that will compliment your wedding dress. This kind of unique necklace for the shoulders can fit any sleeveless wedding dress. moreover, a vintage or Victorian inspired shoulders necklace is completely comfortable, functional and wearable. Looking for a graceful and charming way to cover your shoulders? 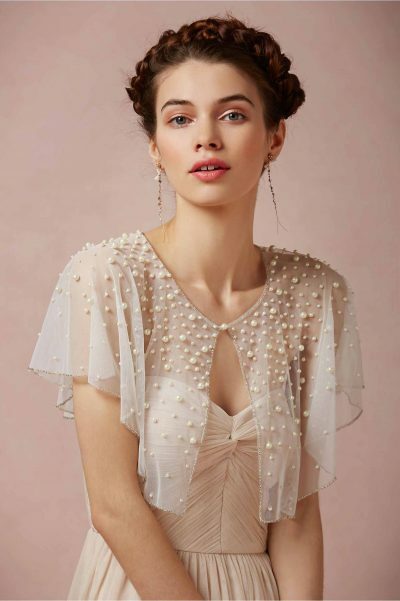 A lovely addition to basically any wedding gown is this dreamy pearl capelet. Out of all wedding accessories, this capelet with glistening pearl drops is one of our favorite bridal pearl accessories. Another wedding accessory item that can’t miss from a bridal look is the clutch. In most cases, a tiny handbag adorned with ivory pearls and beads is the number one choice for a bride who wants to take advantage of the pearls eternal beauty. Just look at these pearl embellished clutches! You’ll immediately spot three different styles that can be achieved: modern, extravagant or vintage! You can’t say “I do!” without the woman’s best friends. Pearls are absolutely irreplaceable when it comes to accessorizing your wedding dress. Brides wear pearls with pleasure because these are the only bridal accessories that can reveal their own beauty. When sophistication is the style you are looking to obtain, the White Dangling Freshwater Pearl and Sterling Silver Earring Set is the one look you are destined to find complete satisfaction with and in. With your hair up to let them shine, we guarantee you’ll look fabulous! A terrific way to accessorize your wedding gown is this pearl set. This is not the classic pearl set (although that one has its own beauty and represents the safest choice for most of the brides), so it will definitely match with a modern style. A treasure to remember for a lifetime, this Freshwater Cultured Pearl Set in Claudia White will bring a sparkling touch and a magical touch! Try it and convince yourself! More refined pearl accessories can be found on our special Bridal Collection. Looking to incorporate pearls in your wedding day in a more discrete way? An exceptional solution would be wearing bridal gloves decorated with delicate pearls. They look exquisite and tasteful! You’re not a fan of classic gloves? Wise and talented designers managed to come with alternatives. Our third selection of pearl gloves represents a modern and extremely stylish interpretation! In the end, it’s pretty clear that pearls will do a fantastic job when it comes to adding a sense of elegance, sophistication, and grace to almost any kind of wedding attire. We showed you just five types of pearl wedding accessories, but the list is not complete. There are indeed countless ways to incorporate pearl accessories in a bridal look, so pick the one that makes you shine most. As a final advice, wear them with an open heart and allow everyone to admire you on your special day!